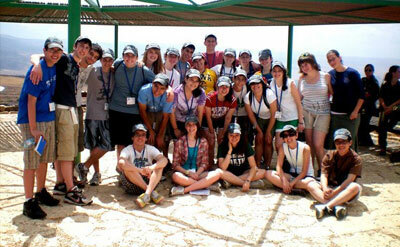 Three Israeli teenagers joined the 23-member Chicago Write On group for three days during the trip. Even almost two weeks later, I'm in information overload mode. You see, I just returned from accompanying the sixth Write On For Israel cohort on their summer learning experience—in Israel. The two-week trip was a mix of touring and learning, and I'm still reeling from all the excitement. In case you missed my last post about the program, Write On is a two-year educational program that prepares high school juniors and seniors for the tough job of fighting Israel's public relations war on college campuses. The trip to Israel in the summer between 11th and 12th grades is a centerpiece of the program. Beyond meetings with journalists, scholars and policy experts—and a brief interview with Knesset Member Einat Wilf—the trip featured several unique experiences. From journeying to Chicago's Partnership 2000 region of Kiryat Gat-Lachish-Shafir in the northern Negev to meeting Israeli teenagers in the Golan Heights to a mifgash (encounter) with Israeli Jewish, West Bank Palestinian and Israeli Arab teens at a Jerusalem YMCA, the trip gave us a glimpse into the lives of real Israelis. As Esther wrote in her post earlier this week, too often we forget amidst reporting on the conflict in the Middle East that Israel is a real country, where real people live regular day-to-day lives. The very first day of programming brought one of my personal highlights: a visit to the Nalaga'at. The attraction, whose name means "please touch" in Hebrew, houses a cafe, a restaurant and a theatre. Beyond good food and moving performances, Nalaga'at is about providing a glimpse into the darkness experienced by blind people and the noiseless world of the deaf. At the Blackout restaurant, foodies select their meals before entering the pitch-dark room. Not even watches or cell phones are allowed inside, where the darkness forces patrons to use the other four senses without having the benefit of sight. Our waitress, Shelli, who had become blind as an adolescent, led us into the dining room and made sure we were comfortable at the table. The waiters (all blind) use bells to figure out their positions so they don't bump into each other as they serve the food. As we ate dinner, we had to figure out how to tell how much food was on our plates, how to fill a glass without spilling, how to pass baskets and carafes without getting the food and water all over us. It was an exercise in teamwork and self-awareness. When you're sitting in complete darkness, you're forced the relieve the awkwardness by talking—so our table shared our reactions to the darkness, played word games and tried to liken the experience to anything else in our past. No other experience comes close to the constant need to focus on what's going on around you when you can't use your eyes. It's about impressions and distant memories rather than fully fleshed-out images. For example, I kept thinking that I was able to see my hands. In reality, my brain was trying to compensate for the lack of vision by sending images to my brain. Given that I know what my hands look like, I was able to "see" them move even in total darkness. Eleven deaf-blind actors recall memories, hopes and dreams in “Not By Bread Alone” at Nalaga’at in Yafo. But the unique experience did not end there. After dinner, blinking in the fluorescent lights outside the restaurant, we joined throngs of others for "Not By Bread Alone", a performance by blind and deaf actors, most of whom lost vision and hearing later in life because of a genetic illness. My mouth gaping open, I was fascinated by the show. I felt a special connection with the actors, four of whom came to Israel from the Former Soviet Union. 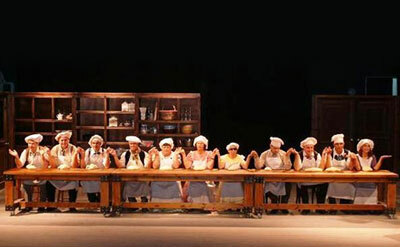 As the smell of freshly baked bread wafted over the audience, I watched the 11-member troupe re-enact memories, recall dreams and joyful moments from their lives. The show, which is poignant and humorous at the same time, had the audience clapping with delight after ever scene. But afterward, as the actors were bowing, I realized that none of them can see or hear our appreciation. Perhaps they sensed the vibrations coming from the clapping or their interpreters conveyed our pleasure through a special touch-sign language. That was the moment that struck me most and made me appreciate how many dimensions of perception I have at my service.